Marc Davis is certainly one of the master animator and draftsman Disney has ever hired. He has worked on iconic characters such as Cinderella, Alice (in Wonderland), Tinker Bell, Maleficent and Cruella De Vil. This book is a retrospect of his work and the influence he has over other artists. I was actually expecting some sort of biography but there's only a short two-page worth of text on his life and career written by veteran animation writer John Canemaker. The rest of the text are essays from Davis peers and those who know him, such as Andreas Deja, Glen Keane, Pete Docter, Charles Solomon, Don Hahn and others. Reading about Marc Davis through the account of other animators and artists is still every bit as engaging. There's also a chapter written by Marc Davis himself based on excerpts of his notes for an unpublished books. This chapter talks about anatomy of motion and provides some drawing tips. The pictures in the book is a mixture of photographs of Davis and his family, him at work, personal sketches, animation artworks from Disney and his paintings. His sketches are lively and the designs are always clear. The characters have their characteristic stance that really brings out their personalities. Besides the pencil sketches, there are also coloured design drawings he did for Disney theme parks. The back portion of the book features his paintings which are not too animation-looking like, but gives us an idea of his personal expression. Last chapter is on his wife Alice Davis with some accompanying artworks from her as well. This book has been getting some flak from other reviewers who commented on the lack of more pictures. 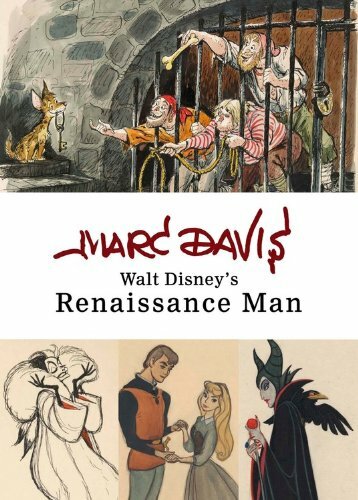 I wasn't familiar with Marc Davis' work beforehand but after a quick search online, I can see many of his artworks, but I can also say that many of those in this book are not available online.